Source: Kayla from Bibliophilia, Please for a RAK! It's been three years since the devastating accident . . . three years since Mia walked out of Adam's life forever.Now living on opposite coasts, Mia is Juilliard's rising star and Adam is LA tabloid fodder, thanks to his new rock star status and celebrity girlfriend. When Adam gets stuck in New York by himself, chance brings the couple together again, for one last night. As they explore the city that has become Mia's home, Adam and Mia revisit the past and open their hearts to the future-and each other.Told from Adam's point of view in the spare, lyrical prose that defined If I Stay, Where She Went explores the devastation of grief, the promise of new hope, and the flame of rekindled romance. 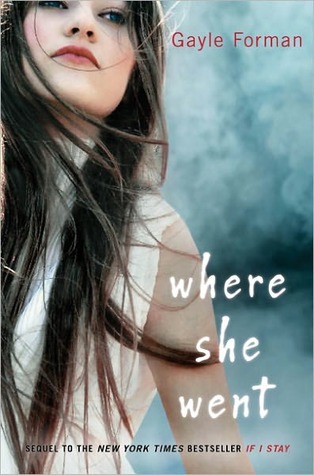 Where She Went was just as real, and hits just as close to home as If I Stay, though without all the sobbing and verging-on-hysterics induced by the first one. Anyone who has read If I Stay will have to agree with me that it was one of the best books of all time, and that it really sticks with you...for a long LONG time in the future. I was so thrilled to find out that there was a sequel because Mia and Adam's stories are just something that you find yourself thinking about YEARS down the road. Yet this book's tone and feeling were a lot more cheerful and hopeful than it's predecessor. It still carries depth of emotion and character, but there is no gut-wrenching cry fests...which I was kind of grateful. I only want to put myself through the emotional wringer every once in a while and I still hadn't recovered from the ending of If I Stay. This novel is told from Adam Wilde's perspective, and if you remember from the first book, he was Mia's boyfriend and pretty much the one contributing factor in making Mia stay alive. He made a promise to her on her deathbed, that if she would only stay, he would do whatever it takes to make her happy. Of course, I'm paraphrasing and in the book it was romantic, and heart-breaking, and beautiful...but in Where She Went, we come back to Adam, and he kept his promise...by not being with Mia. They haven't seen or heard from each other in over 3 years and Adam has been devastated by her loss. It doesn't matter that his band is finally famous or that he's dating a gorgeous actress, every time he looks into her eyes, he sees Mia's there and wonders where she is. I was kind of thrown at first because I was expecting more of Mia and her side of the story, but Adam really stepped up and pulled his weight as a complex, messed up, and really outright fascinating character. Adam is HELLA messed up in this book. He smokes, he drinks, and he trashes tables during interviews with reporters. All because he misses the girl he loves, and is so completely devastated by her cutting him off that he can't deal with life. Mia left him in the worst way possible...by slowly stopping contact until she wasn't answering his emails or phone calls and didn't give him a reason why, or ever even officially break up with him. Though this pain gave him the words and the hurt to write the most achingly beautiful rock-album, it also is keeping him from being anything more than a ghost of his former self. I'll be honest, it was kind of nice to see a breakup from the guys perspective. With girls, the tendency is to be mopey and whiny and just plain annoying when the love of their lives leaves them. Adam, though mopey and kind of whiny, still manages to be a guy, and you can just feel his pain and how completely and utterly destroyed he is on the inside. You feel for him in the very first chapter, and have this terrible NEED to go to him and comfort him. Written in much of the same style as the first book, Adam's story takes place in a little more than just 24 hours of time ( Though actually this book may have been longer). Mixed in with the drama that ensues with Adam and Mia's lives, there are flashbacks to the before. Before Adam was famous, before Mia cut Adam out of her life...even before Mia's accident in some cases. To me, this story was actually kind of short. There is a TON of information crammed into just a few hundred pages, and since we've already gotten to know Mia and Adam before I would have liked to have spent a little more time with them, and the suddenness of some of the events in the book was kind of jarring to me. I felt like things were just this shade of too rushed and could have been developed further. What I love about Gayle Forman's writing is that it is so unbelievably realistic. You have no trouble jumping into the character's brains and just becoming them for a while. You honestly feel their pain, their joy, their sorrow. It's an unbelievable rush that has you praying that the pages won't end, even as you are rushing through them as quickly as possible. I especially loved getting glimpses into Adam's mind when he was younger. The first time he played a guitar, how he felt the moment Mia came back, the sweet stolen moments with Mia when they were both vulnerable, innocent, and young. I actually think that Adam's voice is more realistic, more detailed, and more realistic than Mia's was. You get such a complex web of images that keep you thinking and re-thinking who these people are and what is going on in their lives. Kind of like a real person actually... It was such a wonderful experience for me as a reader and I loved that both Mia and Adam just jump out of the pages at you. I really enjoyed this book. Though it didn't have the same weight of emotion that the first book did, it was still an amazing story and so believable I wouldn't be surprised to see Mia and Adam walking by the street right now. While If I Stay had a tragic compelling reason to keep reading, it still really only had one basic plot: whether Mia decides to stay or leave. In this book, Mia and Adam both truly grow as characters. They are older, and that is definitely reflected in the way they carry themselves and the depth of their conversations, along with the interesting way that the plot moves them. Though you fell in love with the couple in If I Stay, they really become one of those epically great couples that you want to see together forever in Where She Went. Great review. Both books are on my TBR list. Once I get a free moment to read my own books, I will be grabbing these. I still need to read the 1st one! These sound like just what I'm in the mood for.